It has been documented in detail that Robert Sungenis has exhibited a long-standing pattern of exaggeration, from claims about the theological and scientific evidence for geocentrism (see e.g. 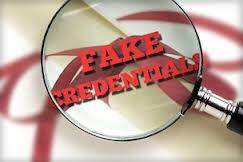 here, here and here) to claims about his academic credentials (see here). The purpose of such exaggeration, of course, is to mislead others about the actual strength of his argument and his personal credibility. As Sungenis presents himself as virtually the only person in the world who is both qualified and honest enough to expose the supposed vast scientific conspiracy to hide the truth of geocentrism from the world, this is no small matter. “I was a physics major in college, and also took astronomy classes, at a major university” (“Is There a Conspiracy Against Geocentrism?”). “Devoid [of scientific training]? Let’s see. I was a physics major in college.” (“Debunking Palm and MacAndrew on the CMB Evidence”). Of course, people will logically conclude by such statements that Sungenis took a significant number of high-level physics courses in the process of successfully completing a degree in physics. It works.1 Sungenis’s claim to be a “physics major” gives a false impression of his actual academic achievements. No reputable scientist would advertise himself in such a way. In short, Sungenis has materially exaggerated his academic accomplishments in the field of cosmology. He said of “Foundations of Physics” that it was, “the first course of my major in Physics” and of “Introduction to Astronomy” that it was, “the second course I took for that major” (link). He also stated that, “GWU requires ‘two approved 100-level physics electives’” and that, “In this category the two electives I chose were Astronomy I and Astronomy II” (link). I immediately noticed some significant anomalies in Sungenis’s recent evidence. For example, “Foundations of Physics” could not be equivalent to GWU’s current “University Physics 1”, since the latter requires that calculus be taken either before or at the same time. Sungenis would not have been eligible to take “University Physics 1” in his first semester, since he had completed no calculus at that time (he stated that he took Calculus 1 his second semester at GWU). Similarly, “Modern Physics” in the current GWU catalog requires a student to first complete both semesters of calculus-based University Physics, as well as all three semesters of calculus. This could not be the same course that Sungenis took. This lays out clearly which courses are prerequisite for a physics major, that is, which courses had to be completed before the student could even begin to take courses that actually count in that major. Thus, Sungenis’s claim that “Foundations of Physics” was “the first course of my major in Physics” is incorrect. Conspicuously absent even from the “Prerequisite courses” list are Physics 9 and 10, Astronomy I and II – courses that Sungenis claimed to have fulfilled a GWU requirement that physics majors take two approved “100-level physics electives”. Sungenis has two problems here. First, according to the University Bulletin in 1975 there were no electives listed that counted either towards prerequisites or required courses for a physics major; so his argument is an anachronism. But even under current requirements Physics 9 and 10 would not count as electives because they are not 100-level courses. Sungenis only took the first two most basic prerequisite physics courses, basic enough that they didn’t require calculus. Thus, he didn’t even finish the four physics courses required to fulfill the prerequisites for a physics major. 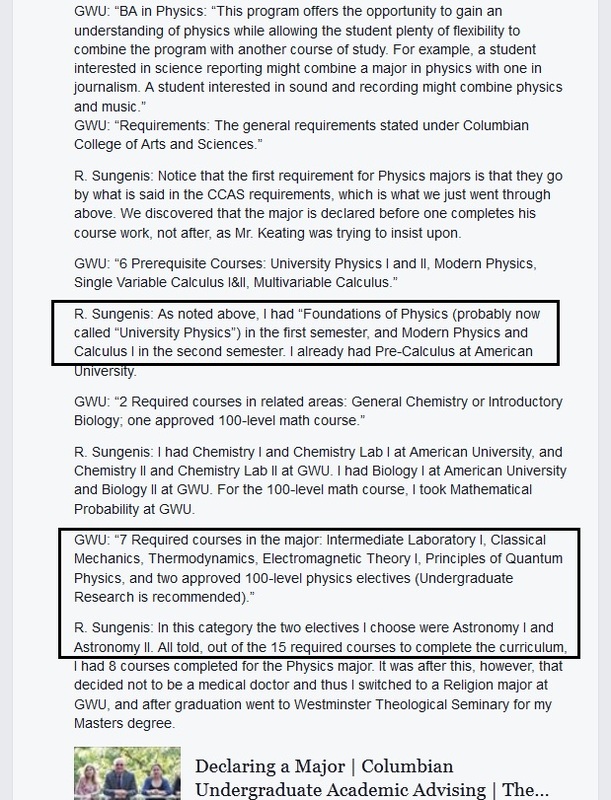 Although he claims that, “I was given a list of courses I was to complete in my four years at GWU”, he inexplicably took two basic astronomy courses that, according to the 1975 GWU catalog itself, would not contribute to the requirements for a physics major and were so basic as to be labeled “Primarily for nonscience majors”. Factoring in his entry-level chemistry courses and one semester of calculus, Sungenis only completed about half of the prerequisite courses toward a physics major – the courses required by GWU to be completed before he could even begin to take courses within the actual physics major itself. Of these prerequisites, only two were actual courses in physics, the two most basic courses offered. Sungenis’s whole claim to expertise in terms of his academic credentials in physics amounts to the two most basic undergraduate physics courses, along with two astronomy courses taught at a level appropriate for non-science majors. That’s it. To insist that these basic courses render an individual academically qualified to take on the entire world of physics and astrophysics is dishonest, delusional, or both. 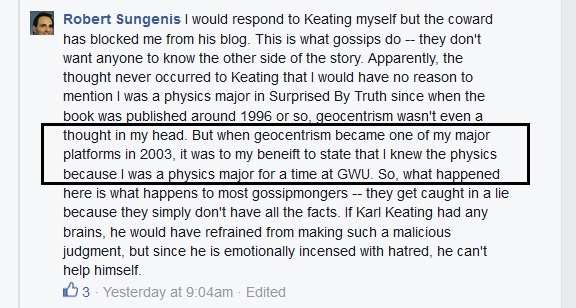 This information provided by Sungenis himself and GWU definitively establishes that, contrary to his claims, he never received the education at GWU necessary to achieve any significant comprehension or mastery of the subjects central to the study of cosmology. This helps to explain his repeated demonstrations of mathematical and scientific incompetence. See, for example, “Elementary Physics Blunders in Sungenis’s Reply to Sky and Telescope’s Camille Carlisle”, “Sungenis Botches the Math Again”, “There He Goes Again”, “The Simple, Scary Mindset of Robert Sungenis”, and “Sungenis Fails the CMB Challenge…Twice”. As others have stated, Robert’s report card in no way supports his claim that he was a physics major. It’s clear that in making that claim he is seeking some legitimacy for his arguments; he is making a claim that he understands classical and modern physics to validate his position and to avoid being brushed off as a scientific ignoramus. 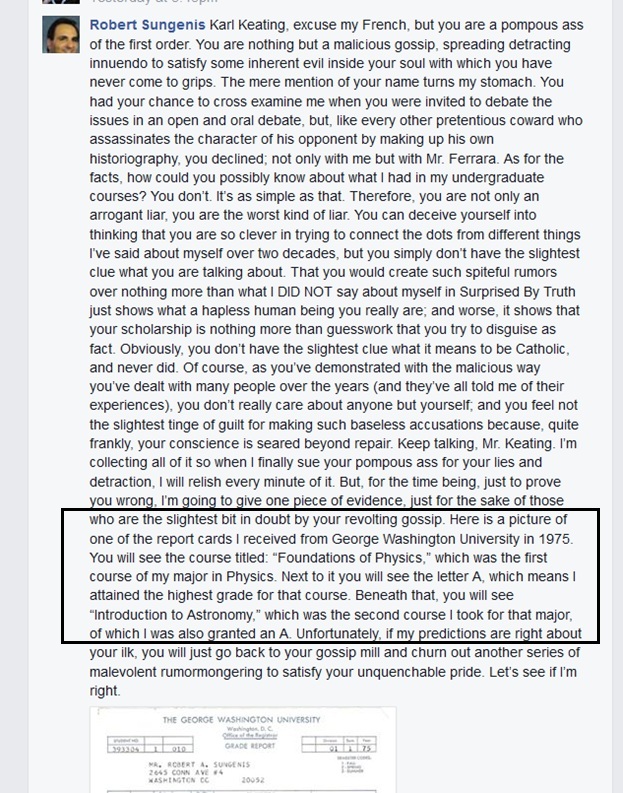 Now, other than the report card (which I have never seen before this thread) and his own claims, there is no direct evidence to support the idea that he repeatedly tries to put in people’s heads that he was a physics major in college. He might have taken a course or two in physics at college – I don’t know. But there are some things that I do know. 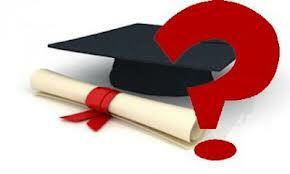 I know that he has made contradictory and incompatible statements about his education. I know that his current knowledge of physics and mathematics is insufficient to earn a pass in freshman physics, never mind to earn a Bachelor’s degree in physics. And I know that far from being brilliant, he is an obtuse and close-minded student of physics – not only does he not know, but he is unable or unwilling to learn, repeating the same gaff over and over even after he has been patiently corrected. People have talked in this thread about physics courses taken early in one’s undergraduate career by physics majors. Of course, they have different titles in different institutions, but it is common for these first year courses to include classical or Newtonian mechanics, and something called Vibrations and Waves or Harmonic Motion or some such. In addition, physics majors would take mathematics: differential and integral calculus, vector algebra, matrix algebra, set theory, series expansions of functions and so on. In every case, Sungenis shows absolutely no sign of understanding even the most basic concepts in classical mechanics and shows every sign of misunderstanding. In mathematics, his knowledge is demonstrably poorer than a bright 8th grader. 6) The meaning of such foundational terms as: inertial frame of reference; orthogonal. I have documented his many failures in elementary mathematics (at a level in the subject that is way below that which would be needed as freshman physics major) on David Palm’s website. Amongst other things, he appears not to understand the need for expressions in physics to be dimensionally balanced, he clearly doesn’t know any vector algebra, and he is even confused about scientific notation of numbers. He constantly bungles simple arithmetic. So on the evidence of his current knowledge, Sungenis never was a physics major, or at least not long enough to learn any elementary university level physics and mathematics. [NB: Dr. MacAndrew is right. University physics requires calculus and Sungenis took no calculus-based physics courses.] As I said in my last article on David’s website: “There is no shame in not knowing about a subject, but there should be shame in not knowing and yet pretending that you do, especially when you use your counterfeit knowledge to bamboozle others.” (link). Science didn’t become a part of my daily contemplation until about 2003 or so when I began my studies on Geocentrism. Since Geocentrism requires a knowledge of Physics and Astronomy, and since an unpopular subject like Geocentrism requires its adherent to have knowledge of both, it was to my advantage to advertise my major in Physics at GWU for the sake of credibility (link). There you have in a nutshell the reason Sungenis continues to mislead people by exaggerating his scholastic accomplishments and credentials – it’s because he knows full well that credibility matters. 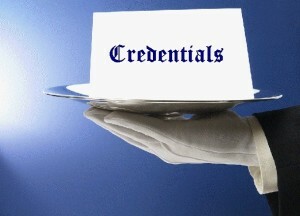 He’s willing to materially exaggerate his accomplishments and credentials in order to appropriate for himself credibility that he has not legitimately earned. 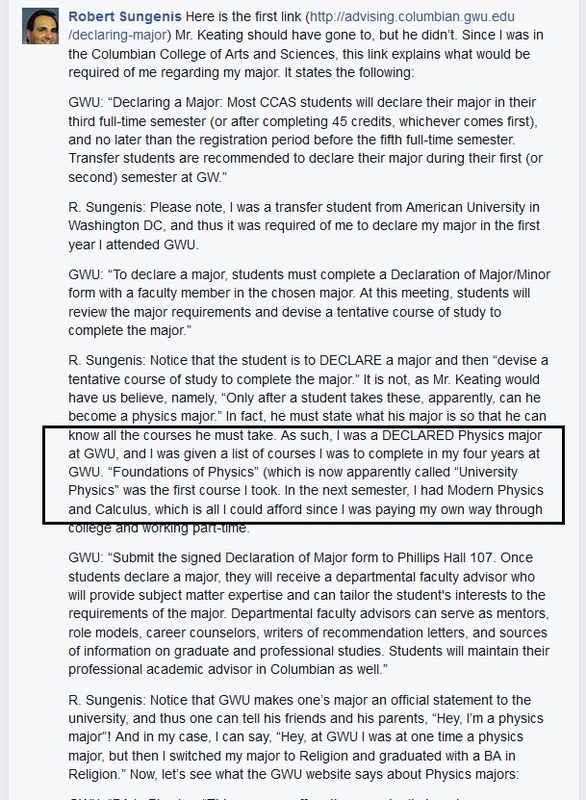 No reputable person would refer to himself as a “physics major”, let alone as a credible scientific authority, based on the paltry study that Sungenis completed at GWU. Of course, neither would a reputable scholar tout a “Ph.D.” from a degree mill. But perhaps even more importantly, far from having any demonstrated competence through legitimate academic accomplishments, Sungenis repeatedly demonstrates his incompetence in the field of physics. His writings on geocentrism are shot through with mathematical errors and scientific misunderstandings (see e.g. “Elementary Physics Blunders”, “Sungenis Botches the Math Again”, “There He Goes Again”, “Sungenis to Catholic Answers: Get Some Science Education!” and “Sungenis Fails the CMB Challenge…Twice”). Likewise, his fellow geocentrists have not fared well when challenged to demonstrate their competence by producing their own, real mathematics or science (see, for example “Geocentrists Fail the Lagrange Point Challenge”, “Geocentric Physics: Is That All You’ve Got?”, “Dr. Tom Bridgman Weighs In On Flunking the Lagrange Point Challenge”, and “Will the New Geocentrists Take the CMB Alignment Challenge?”). And this group has topped it off with habitual plagiarism, conspiracy mongering, and egregiously citing sources out of context. 1 For instance, one fellow claims flatly that, “Sungenis has a degree in Physics, too” (link). Another individual who actually did earn a degree in physics asked Sungenis about his academic credentials: “[Sungenis] personally told me he was a physics major.” And what natural conclusion did the questioner reach? “Sungenis has an undergraduate degree in physics,” he insisted (see here and here). In fact, so strong was this person’s conviction after communicating with Sungenis about his physics credentials, that even after another commenter pointed out that Sungenis never specifically mentions any actual degree in physics, the fellow replied, “Just because he doesn’t mention it there doesn’t mean he doesn’t have such a degree. He personally told me he was a physics major” (link). I’ve been studying science all my life. I was a Chemistry and Physics major in college, studying for pre-med” (see here). Sungenis wants his readers to believe that he had such thorough, in-depth experience at the university level in chemistry and physics that he can personally tell them “first-hand” about the terrible shortcomings of science. It’s hard to convey how inflated such claims are without lapsing into ridicule.